1. First make the sauce for the spaghetti. Place all the ingredients except the basil into a pan and simmer gently for 10 minutes until the sauce is reduced and thickened. Add the basil and whizz with a stick blender until smooth. Season and set aside. 2. For the veal, take 3 plates, putting the seasoned flour on 1, beaten egg on the next and breadcrumbs on the third. Take a veal escalope and dust first in flour, then dip into the egg and finally coat evenly with breadcrumbs. Repeat with all 4 escalopes, placing them on a plate to chill in the fridge until required. 3. Bring a large pan of water to boil. Add the spaghetti and cook for about 10 minutes, or until al dente. 4. Gently warm the sauce in a large sauté pan. Heat a frying pan and add 2 tbsp olive oil. Fry the veal in batches for 2 minutes on each side, until golden and crisp, wiping the pan out in between each with kitchen paper. Keep warm in the oven on a rack so as not to go soggy. 5. Drain the spaghetti and toss into the warm sauce. 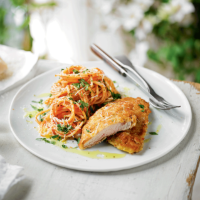 Serve the crisp, golden veal escalopes with the spaghetti, topped with Parmigiano Reggiano and parsley.